The Bulls vs The Sharks last weekend in the Currie Cup met for a Super 14 finalists rematch. The Sharks scored two tries in each half for their bonus point in a match of great excitement for the 27 000 spectators. The game was effectively spoilt in the second half for a short period with the instant red card given to Bulls flyhalf Morne Steyn by referee Mark Lawrence for a spear tackle on flanker Jacques Botes. The IRB clearly is attempting to stamp out on any form of the spear tackle. 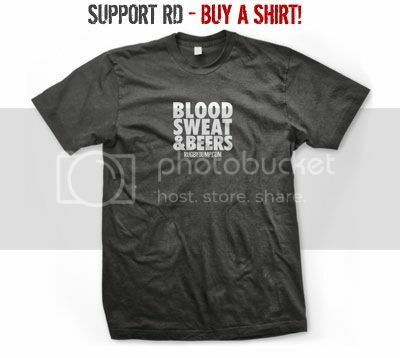 In my opinion, very harsh, and I'm a Sharks supporter. This is the haymaker of all haymakers. Possibly the most legendary, and at the same time infamous, punch seen on a rugby field to date. Argentina's 18-year-old prop Federico Mendez leaves the pitch after being sent off following a punch that laid out England's Paul Ackford. Mendez was winning only his second cap. 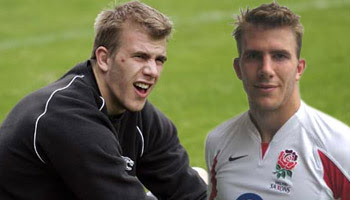 He would later claim that he had been provoked by opposing prop Jeff Probyn, whom he accused of stamping on him, and that he had meant to hit Probyn. England won the match 51-0, avenging a 15-13 defeat four months earlier, and secured their first grand slam for 11 years later that season. Gethin Jenkins charge down, kick ahead, try! Welsh front rower Gethin Jenkins is fast making a name for himself as one of the best props around. For a man his size he has amazing ball skills and can move quicker than most men who ply their trade in the front of the scrum. Just ask Ireland. As Ronan O'Gara went to clear, Jenkins came out of nowhere to charge down the ball, chase it hard, and then dribble it with control that countryman Ryan Giggs would be proud of. Falling on the ball to score a fantastic try, O'Gara stood on his fingers, which prompted the ball throwing. All in good nature though, part of the game. Another contender for one of the best prop tries ever. Cardiff Blues number eight Mark Lewis heads for the line to finish off a nice try. Saracens and former Bok scrumhalf Neil de Kock comes flying in for the tackle though with the intention of stopping the try obviously. De Kock hits him hard, with his head unfortunately, and Lewis ends up scoring the try but being knocked out stone cold. He apparently eventually got up with his first question being whether he'd scored the try or not. 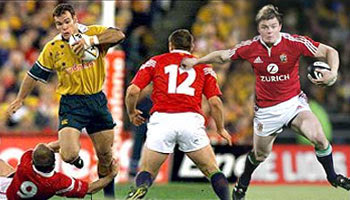 Superstar Irishman O'Driscoll gets hammered by Wallaby center Nathan Grey on the British and Irish Lions tour of Australia in 2001. Massive hit, resulting in the turnover and penalty for the Wallabies. 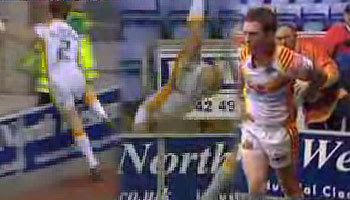 Justin Murphy flips over advertising boards! Speedster Justin Murphy has an unfortunate collision with the advertising boards in this Rugby League match between Wigan and the Dragons. Murphy unbelievably comes out of this unscathed and takes to the field straight away. He's lucky he wasn't knocked out with broken legs... or worse! Incredible. One of the best passes of a rugby ball to ever play the game, Stephen Larkham will tomorrow play his final match at home for the Wallabies. This will also be his 100th Test Match, a tremendous achievement in the modern era. He'll be retiring from international rugby after the World Cup and will then be plying his trade in Edinburgh. Larkham infamously sunk the Springboks in the '99 World Cup semi final when he hit that legendary 40 meter dropkick, the first (and I think probably last!) of his career. 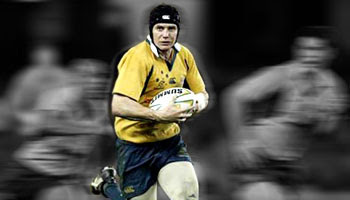 A brilliant tactition with incredible running and passing ability, Larkham will always be remembered for his highly successful partnership with halfback George Gregan, for the Brumbies and the Wallabies. A true legend of the game. A fantastic set piece 'Wall' try, as seen in days gone by, scored here by the Sale Sharks vs Ospreys in the Heineken Cup. Argentinian Fernandez Lobbe finishes it off, but the deception and trickery is set up by the halfback and the forwards. Clearly a training ground move that worked. The question is, why isn't it seen more in rugby? One answer could be that it's illegal to shelter or hide the ball from the opposition like that. I'll have to get my rule book out and check, but a great try nevertheless. The day the lights went out on Boet Erasmus stadium, both literally and figuratively. Prematch, there was a power failure in the stadium which delayed kickoff. This seemed to add to the tension on the field. 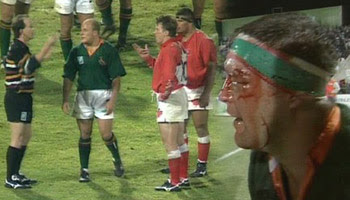 By the time the Springboks met Canada on the field in this pool game during the 1995 World Cup, tensions were already flaring. Talk before the game was that the Canadians don't normally stand back for anything, and almost take pride in being tough S.O.B's. It was a hard, physical match, which eventually boiled over with this now infamous series of events. The scuffle between Pieter Hendriks and Winston Stanley was under control until Kamakazi fullback Scott Stewart came flying in with a hit to the back of Hendriks' head. James Dalton, who unfortunately had quite a reputation in the past, came to his teamates aid, but seemed to spark things even more. A mass brawl ensued. In the end, ref Dave McHugh and his assistants decided to send off Dalton, Gareth Rees and Rod Snow. Dalton was judged to have sparked things, even though he later swore that he put his arms up when he ran in to protect himself, nothing more. Gareth Rees was in the middle of the punchup. No idea why Rod Snow was sent off. Both Pieter Hendriks and James Dalton were banned from the rest of the tournament, subsequently missing the Springboks' historic World Cup Final win against New Zealand. The good news was that Chester Williams replaced Hendriks, going on to score a then record four tries against the Samoans and becoming a national hero. Chief instigator Scott Stewart was never cited nor found guilty for his part in it all. Note: Lookout for Hennie Le Roux's haymakers in the middle of it all. He was also lucky to get away with it. I've had quite a few requests for this 60 meter match winning try by England Saxons replacement lock Tom Croft against the New Zealand Maoris in the Churchill Cup. He's a 1.98m youngster who weighs 104kg. He plays lock and can also play as a loose forward, as you can see by the splendid pace shown here on the right wing. Looks like he's coasting but he outruns the Maori players. Good try. 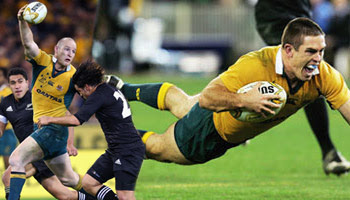 This is the match winner against the All Blacks from saturdays Tri Nations and Bledisloe Cup game in Melbourne. 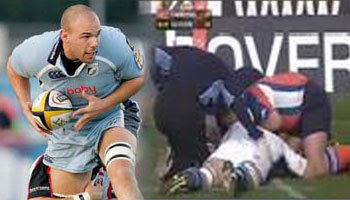 Finished off by sub Scott Staniforth, it was created by big Aussie centre Stirling Mortlock. Mortlock showed us what we've been used to seeing from him in years gone by, with him using his considerable bulk to bust through the midfield, stepping two players and then putting the foot down. The final pass over the top was pinpoint, finding Staniforth to put the Aussies 20-15 in the lead with 8 minutes left. The score stayed that way and the Wallabies won match one of the Bledisloe Cup, squaring up the Tri Nations with all three sides on equal points. In front of 79 000 at the Melbourne Cricket Ground, the All Blacks performed one of the newer versions of the traditional All Blacks Haka. I stand to be corrected, but I think this is a slight variation of the newer Kapa O Pango. It was brilliantly led by speedster right wing Rico Gear. The crowd, who were a large part Kiwi, cheered througout and in my opinion, this is one of the more inspirational Haka performances I've seen. Great stuff. Waltzing Matilda straight afterwards doesn't quite compare in the psych up stakes, but hey, each to their own.